I bought my 10ft Porta-Bote in August 2001, I'd read about them online and decided that it would be ideal to get access to the local Warwickshire Avon and Severn without having to use the scarce slipways that restrict access. I found it simple enough to assemble and was soon heading for the Avon with an ironing-board apparently strapped to the roof-rack, the seats and transom take up space inside the car although they could be strapped to the roof bars as well if space was tight. Then I was afloat, powered by a 55lb Minn-Kota. I took 2 110Ah batteries out, when the first one ran flat it was time to turn around and head home. This meant that range was severely limited if I wanted to travel at a realistic speed. The weight of the batteries was also a serious issue; firstly they are seriously heavy things to move around and not really safe to load into the boat from any sort of high bank. Next they are not easy to move around in the boat, so I kept them both against the transom, this upset the trim of the 'Bote, keeping the nose a little high and making it very badly affected by cross-winds. Not a problem with another angler in the boat as ballast at the front, but very difficult solo. I'm sure the transom weight with these two heavy batteries against it was well above the safe recommendation. In spring 2002 I bought a Honda 2HP outboard, its light weight made it ideal and as a 4-stroke no need for messing about mixing fuel. This was an ideal match and made the 'Bote much more practical and it handled properly without the batteries aboard! Now I was out everywhere on the Severn and Avon, covering many miles each day. 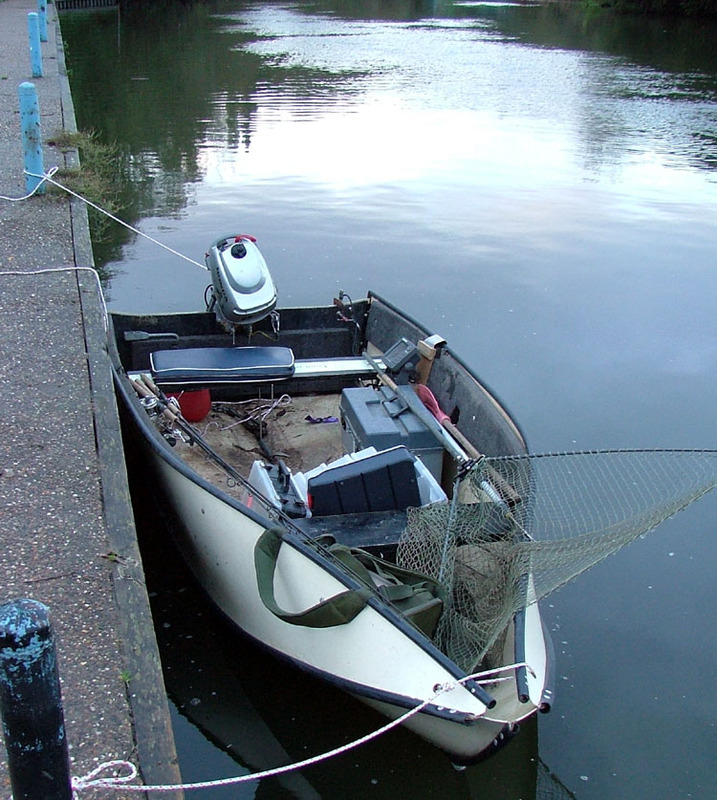 The 10ft 'Bote is restricted to a 2HP motor, I believe it is 5HP on the 12ft version. The 'Bote is very light and rides waves very well, the wash from oversized gin-palaces going too fast along the Severn is a fair test and they caused no problems, strong south-westerly winds can set up a fair old swell on some stretches along either river and these too were easy to deal with, for its size it is a very safe boat, although passengers can take some persuading until they have actually survived a rough trip! The flexible hull seems to act as a cushion against the waves. That flexible hull is a little odd at first when you stand up - unkindly compared to standing on the skin of a blancmange by some - but it is easy to get used to and with a couple of average-sized blokes standing and casting big lures it is steady enough, again the flexibility means that one angler is not at the mercy of every move the other makes. Other small boats I've used are not so good for this job. After a few dozen trips I noticed that the wire legs were pushing through the thin plastic shell of the foam-filled seat. I tried to repair and prevent this by reinforcing the rest points but I could not get the steel plate I used to stick to the plastic. I rang Intramore, the UK distributor where I bought the 'Bote and they agreed to send me a new seat. But I could not see that being anything other than a temporary solution so I made some new seats from plywood. I should mention here that I never use the middle seat, it takes up valuable space and is not necessary for rigidity. I've never unwrapped the new seat they sent. The wooden seats are naturally rather uncomfortable so I have to take cushions out now as well. The 'Bote went to Eire for a windy week of torrential rain, out on Lough Allua with a good blow was a test for the 'Bote and my courage, after chickening out when I first saw the waves on the open Lough I practised in more sheltered water and eventually crossed the main channel. Quite exciting! Mike Lench and I got a bit damp as I mistimed some of the waves and some impacts shot spray all over us. I don't think we were in any real danger but the problem was a lack of power, I couldn't hold the correct line into the wind. It was much easier coming back with the wind behind us although I was given a nasty turn when John Cahill overtook us and the wake from his boat synchronised with the swell and caught us a right wallop, that was a bit of a "brown-trousers" moment. But having survived Allua I know that there is nothing on the Severn or Avon that will ever cause me any problems. All this stuff has to be carried from the car to the launch, it's OK when you can get nice and close but when it's 50yds including a flight of steps it can be tedious... about 7 trips will do it if you're organised. It's usually more like 10 though! Ready to go. A solo trip in November 2005, with far more lures than I'll ever use. The big Plano box does not contain lures but a load of essential items all individually boxed up - unhooking and other tools, marker floats, first aid kit, lure retrievers, camera, permits (boating and fishing), scales and weighsling, spare hooks and split rings, leaders, lure modification kit, cloth, toilet paper, repair tape. Because the floor of the 'Bote is not flat I attach a little clip on the back of the box to the seat mount for the absent middle seat. Everything loose does tend to find its way into the middle. There is a metal cowl that fits over the prow to tidy it up, but I've never used	it because it's something that contributes nothing to the Porta-Bote's function, adds time to assembly and would be no more than a line trap. Now coming into the winter of 2009 the 'Bote still gets used regularly on the Avon, but less so on the Severn since I bought a 14ft8in GRP dinghy, that is very spacious and does remind you how tiny a 10ft boat is. It has developed an intermittent leak, where the skin of the transom joins the plastic of the hull I occasionally get a little water seeping in, not enough to be a problem - maybe a pint or so in a day at worst, and some days none at all - but I may have to reseal it with silicone at some point. Despite the occasional Mickey-taking the Porta-Bote bug appears to be spreading locally, with at least 4 friends getting them having either been out with me or seen me whizzing about on the Avon, which is a pretty good recommendation. James Ashworth has recently bought a 10ft version because his previous aluminium car-topper was too heavy to be loaded onto the car solo. And the new ones now have a plastic transom. How durable that will be only time will tell, our first trip out on it ended badly, we could not get the outboard back off the transom, there was a plastic lip stopping the clamps from coming free. As it got dark we were forced to attack the plastic with a knife to cut away the offending plastic. James has since removed the seats and transom and made plywood replacements. Many thanks for speaking with Mr Lawrence and we also appreciate your other comments which we've passed on to PortaBote in the US as part of their strongly encouraged customer/distributor feedback program. We still use our first 1999 bote which has the original wooden seats and transom. Personally, I find the closed-cell foam on the topside of the seats more comfortable to sit on for long periods, and its also useful to be able to fit the occasional accessory to the wooden transom board – cleats, rod-holders, etc.. But I have to admit the newer seats and transom board are a lot lighter to carry as a package, and of course they’re completely maintenance-free now. This is a very attractive attribute for many customers, and you’d be surprised the numbers of enquiries we get from existing owners asking about "conversions" from wood to plastic! The plastic seats were indeed modified shortly after they were introduced in 2001 to fit reinforced rollers where the wire struts attached to the undersides. This helps to prevent the narrower struts from being driven into the seat under heavy loading. The transom was changed when the new 14ft bote was first introduced to allow bracing bars to be fitted for a heavier engine. It made sense to standardise the lighter transom for the other models as well. We've had a couple of issues with the new transom retaining small amounts of water and PB have since modified them further by drilling drain holes. Hope this helps, and once again, many thanks for your continued support (and recommendations!) Very best wishes Jean"
In summary: on the downside the old seats were not up a lot of hard work, the new transom caused James probelm and they are not cheap, I think they would still look expensive at half the price. But the plus points far outweigh those annoyances: it really is easy to store, transport and launch almost anywhere (a 3ft drop is no problem but any more than that is going to prove awkward when loading all the gear and the outboard after it is in the water). It is undoubtedly a proper boat, it handles well and safely, the hull appears indestructible and it is an effective fishing tool. Mine has survived some very rough handling, I expect my kit to just do what it has to without me having to worry about it much, and the Porta-Bote has delivered. If I lost mine, I'd buy another. I've recently started attaching the outboard before lowering the 'Bote into the water, this is much easier than struggling to reach for the outoard and then attaching it while standing in the 'Bote. On a couple of trips late last season the slight leak had become more serious, not dangerous, just a lot of trouble to keep getting the water out. I rang Intramore and asked how I should fix it. Roger told me about the glue I needed, apllicators that I'd also have to buy and where to get some. At the time I had been on short-time working over the winter and did not have the cash to spend, and since I don't use the PortaBote in the summer I thought I'd wait and get it done in September. I actually found the stuff online and ordered it, only to get an email a few days later saying they had not got it in stock, I agreed to wait because I was still in no hurry. About 4 weeks later my goods arrived. The glue is a two-pack Scotch-Weld acrylic which sticks just about any sort of plastic to any other with a flexible bond, it requires no surface preparation. I washed the Portabote as best I could then filled it with water to see exactly where it was leaking. Water dripped out steadily where the flexible plastic of the transom met the join in the middle of the hull. There is some rubber-type insert there to seal it and this had deteriorated. I tipped the water out of the 'Bote and let it dry thoroughly for a few days. The instructions that come with the kit (a basic diagram printed on the outside of the box) are very minimal and actually misleading but common sense immediately flagged up an innacuracy and I eventually assembled the applicator and glue and got to work. This bit was pretty simple, I squirted the glue into the joint from inside and out and that was that, took 30 seconds before I couldn't see anywhere else I could put any. It is supposed to go off in 10 minutes, I left it an hour and prodded the visible glue, it was dry but like a spongy foam. I partly filled the 'Bote again with water and waited. Not a drop coming out so it must be fixed. Easy! The next day's fishing trip confirmed that the leak had been completely fixed.